Early philosophers of TCM believed that tao is the creative force of the universe, all pervading, beyond form and material substance. Tao means the way and this also represents a method of living in harmony with our environment and beyond. Living in such a way was not so much about living a life free of disease, but living a life which was whole and rich on the physical, emotional and spiritual levels resulting in a balanced existence. 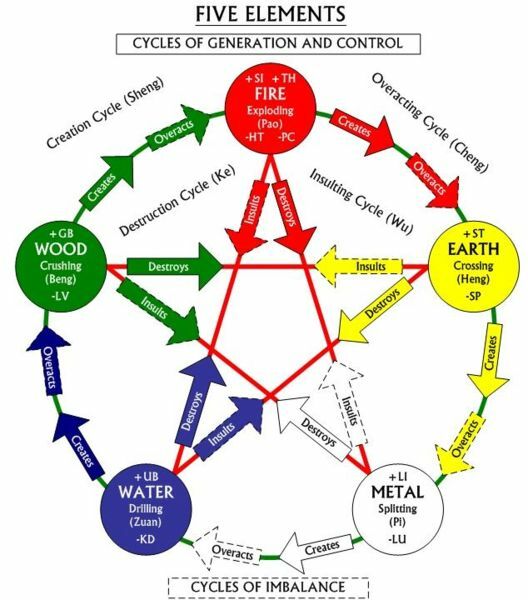 Wood, fire, earth, metal or water – which of the five phases clearly defines your nature? When asking the question, ‘who am I?’ and determining your affinity with one of the elements we gain insights into not just what ails us, or makes us imbalanced, but also that which heals us and meets our spiritual desires, our soul food. Each of the elements is central to the whole, for life, as we know it, could not exist without each of them. Each power generates and sustains the others, and any excess or deficiency will send ripples through-out the body, for we are a river fed by different streams, each of which nourishes our spirit. The nature of fire is to burn and ascend. It’s dominant in the summer, and is related to growth and maturity. This is ultimate yang in yang time and the best time to treat conditions of the heart or shen. Noon is the time for the heart in the Chinese clock, with heart conditions feeling better around this time and worse around midnight. Shen may be likened to the crowning flower of a plant and the other aspects of our spirit may be seen as the leaves that make up the body. All these components come together to form our mind and spirit, the shen being master of these various emotional and spiritual aspects. The shen controls our insights and gives us understanding. It is therefore said that the heart controls our consciousness. This is where we derive our creative energy, intuition and perceptions of the world around us. When the heart is healthy it controls our emotions and keeps the other spirits in balance – we experience true joy. When the heart is weak, the emotions and spirits can become subordinate and disturb the mind. The shen then loses its regulation over the kingdom and the heart can become disturbed and prone to emotional problems, nightmares, stress, anxiety, and irritability. The earth element represents the centre in the five phases. Spiritual quality is centredness, and a balanced earth person will be supportive, relaxed, considerate, well-integrated and centred. Any excess will manifest as over-protectiveness and worry while deficiency could result in a hunger for nourishment, an obsessive individual constantly searching for answers outside themselves. The period just between the transformations of one phase to another and in between one season and another is when the phase moves to earth. Earth represents the centre, it is neutral and the balance of yin and yang energy is equal and thus can relate to all phases. Afternoon is the earth phase of the daily cycle. Yi, or our intent, is the spirit residing in the spleen, our earth organ. Another of its functions is mental digestion. When we have a healthy yi, our thoughts are balanced, for it presents the heart with images that create our thoughts. The nurturing and bonding aspect of the earth element has its crucial first beginnings with the mother-child relationship. This first bond is a template for future relationships. If our early relationships and bonds are unhealthy then these create an unhealthy yi. It may result in unhealthy relationships and bonds, with people, substances and addictions, later on in life. The metal element includes the lungs. Its season is autumn and relates to harvest time. 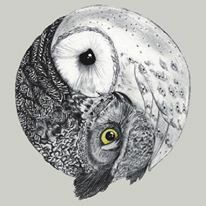 Its nature is contracting and yin within yang. A balanced metal personality will be accepting, disciplined and calm. These types are grounded by earth and inspired by heaven. They are creative and philosophical. The lungs are the primary organs and the po represents our animal soul and instincts. A healthy po will give us an adventurous and optimistic person. Someone who has the attributes of great explorers, who possesses boldness and vision, is said to have a strong metal element. The metal element is also responsible for letting go. People with a metal weakness may manifest as not being able to absorb and let go experiences, leaving the person emotionally dry. The natural quality of metal is to be malleable and strong. Excess however will manifest as hypercritical, dogmatic, perfectionist and self-righteous. Deficiency is needy, clingy, self-doubting and hypersensitive. The water element is represented by winter; ultimate yin, night is yin time. Zhi translates to willpower and not only represents our goals and inspirations but the determination to make our aspirations a reality. An imbalance in this element can result in a lack of motivation and a battle with spiritual and physical fatigue. If the kidneys are severely disturbed, the defences of both body and soul will be lowered, leading to disintegration of the spirit and loss of the will to live. Yielding and full of potential is the natural quality of water. This element generates a candid, watchful, curious and wilful individual. Imbalance may manifest as inflexibility, suspicion or being over-opinionated. Deficiency will result in isolation, cynicism and lethargy with personality types who lack the ability to be. This element relates to spring, yang within yin. Hun translates to mean the ‘individual soul’. The hun is stored within the liver and its spirit represents our higher consciousness. Other aspects of the hun include our intuition and imagination. These higher functions of humankind contain the subconscious aspects of imagination and inspiration. Emotional activity is also closely associated with the liver as the liver is responsible for the free flow of qi, and the shen is only at ease when the flow of blood and qi is normal. When we have a healthy wood element, we have a free flowing of qi. This makes a human being flexible in both body and mind. When an imbalance of wood occurs, individuals may repress their emotions making them accumulate, not unlike a pressure cooker. These emotions may eventually explode in a furious outburst resulting in rebellious qi and anger outbursts. A person with an affinity to wood is driven by a need for action, movement and fulfilment. Spiritually creative, these types are solid yet supple with a nature that is growing and spreading. They are assertive, confident and decisive when they are balanced, but can be aggressive, arrogant and tyrannical if excessive. If a deficiency exists in the element then they can be ambivalent, passive and intolerant. “I call it Tao, and I name it supreme” Lao Tzu. From Tao we have yin and yang, and the universe was formed by the separation of yin and yang, and the continuous interplay between these polar opposites formed the basis of life. This theory holds that every object or phenomenon in the universe is two-fold in nature; that the dual power arose from the primary state and gives birth to the Chinese idea of change, and change is the expression of the unceasing interactions between these dual forces. Change is the only constant and is thus unceasing. Classical Chinese thought further separated these into three. We have heaven, which creates earth, that then creates humanity. “Humanity aspect relates not only to individuals, but also to all living beings on the planet, animal and plant life. All are placed between heaven and earth and in these kingdoms they all follow Tao. It is humanity’s conscious choice and whoever disobeys the laws of heaven and earth must die.” This further separated into the four seasons and from there the five phases arose. 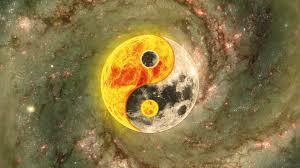 These elements are considered as forever changing as yin and yang. Each of the five elements has a correlation with corresponding organs and these organs house and nourish the individual spirits. When the spirits and organs are healthy, then we have healthy expression of the human being – imbalance of the elements will result in pathology. Realising this connection between humanity and the heavens, through the five elements, not only gave the ancient Chinese sages a scientific basis for their medicine but an understanding of the importance of living in harmony with nature and the seasons, promoting a long and prosperous life. The Chinese now had an understanding of the basic building blocks of life. Cycles are not only mirrored in human beings, but also in their environment, creating the link between the microcosm and the macrocosm. Can this not also be likened to the theory of alchemy, the belief that matter was capable of being ‘transformed’ into another form? Jung viewed the Self and the act of individuation as an internal alchemy. Furthermore the alchemist believed that all matter, like man, had the potential to be perfect. The Taoists believed that to live in accordance with nature and the elements gave man a perfect existence while extending their life span to over 150 years. The Chinese believe that all matter was like a human being, alive and sensitive and having a spirit or made up of a certain type of qi, and therefore there was no clear distinction between humanity and matter, or humans and their environment. As humanity can have an effect upon the environment, it can occur vice versa, with seasons, emotions and a number of different factors both creating disease and health in humanity. The five elements are not just the building blocks that make up the universe and all that it contains, but they are also a process – a transformation with distinct qualities and phases of an ever-changing and beautiful cycle. This makes the elements more than just the material basis of life, as we know it, but stages or conditions, with no beginning or end, just a transformation of one element into another, no less than the never-ending cycle of life. This continual dance between the elements is the beauty of our existence and what makes us unique, not only as a species but as individuals.